When I was growing up my German-American father would always exclaim, “Gesundheit!” (which means “health” in German), after I sneezed. I sneeze frequently this time of year due to allergies – just ask my co-workers – I have the loudest sneeze in the office! (Thanks to my vocal training perhaps?) Needless to say, there are many shouts of “Gesundheit!” in our office this time of year. Is Goldenrod Pollen the Cause of Allergies? 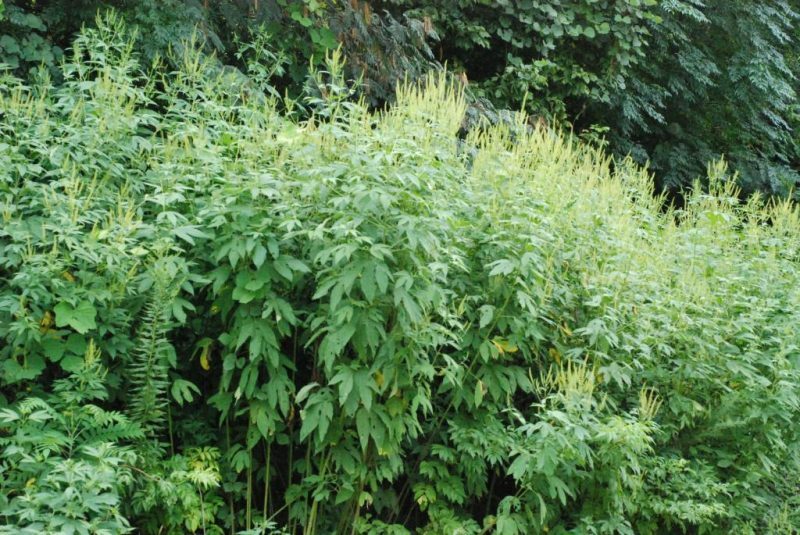 Many lay the blame for our end-of-summer allergies on the ubiquitous masses of Goldenrod that emblazon the landscape this time of year. And the clouds of pollen in the air – the pollen smog that precedes the itching, sneezing and running of the nose? It must be the fault of the Goldenrod, right? WRONG! Next to the beautiful bright yellow Goldenrod sits Ragweed – nondescript and barely noticed – releasing vast clouds of pollen into the air in a quest to pollinate at the end of summer. And so the sneezing begins! 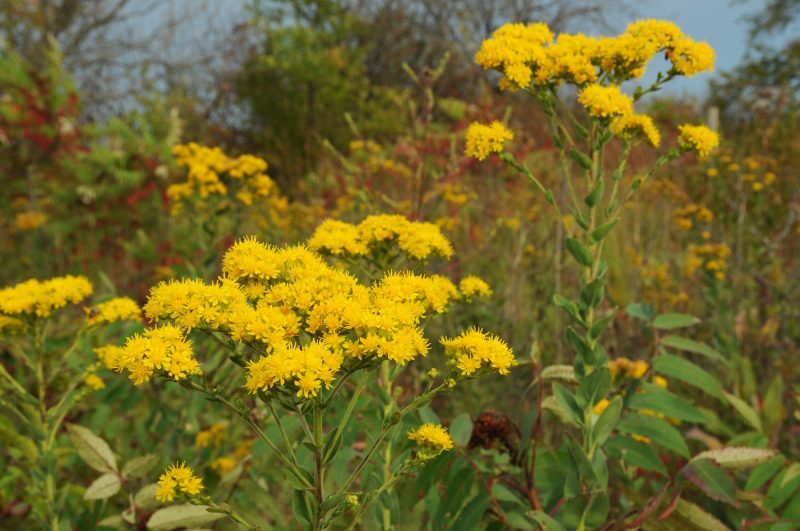 For many years, the beautiful Goldenrod has taken the fall. Goldenrod pollen does not travel in the air at all. Instead the pollen is transported from flower to flower by butterflies, bees and other insects. My stand of Showy Goldenrod was just covered in bumblebees the other day, collecting pollen on their wings and feet in the September sun. Bees gather up the pollen carry it off to their hives. The pollen is never air born, and thus cannot be blamed for our allergies. 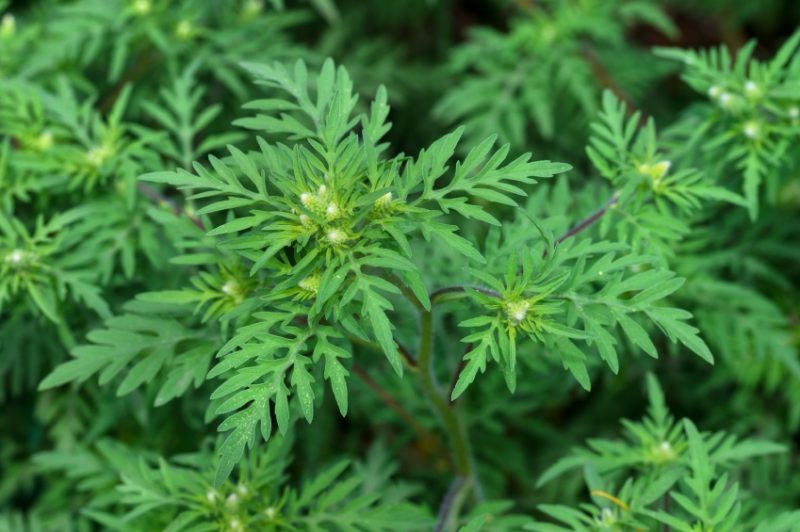 Ragweed with its air born pollen is the culprit. Many species of Goldenrod provide color well into October, including Ohio Goldenrod (Solidago ohioensis), Showy Goldenrod (S. speciosa) and Stiff Goldenrod (S. rigida) – all prefer full sun. Delicate shade loving specimens such as Zig Zag Goldenrod (S.flexicaulis) and Anise Scented Goldenrod (S. odora) add a splash of color in a woodland garden. Goldenrods provide an invaluable shot of late season nectar and pollen for bees and butterflies. 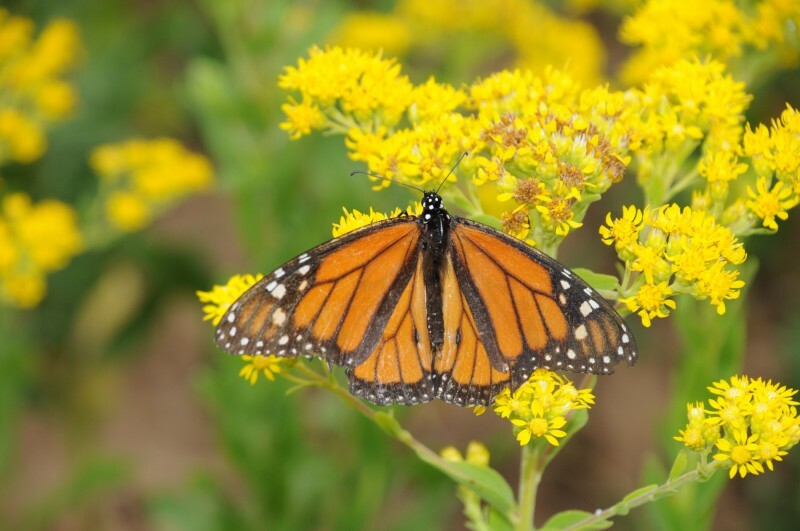 The Monarch butterfly in particular relies on Goldenrods and other late season blooms to sustain its fall migration to Mexico. I love this blog enrty. I’ve been saying the same for years. I’d like to put in a word for two of my favorite shady golderods, Blue-stemmed Goldenrod (Wreath Goldenrod)/Solidago caesia (http://www.ct-botanical-society.org/galleries/solidagocaes.html ) and Silverrod/Solidago bicolor (http://www.ct-botanical-society.org/galleries/solidagocaes.html ). The latter is white, rather than yellow and, here in Eastern Massacusetts, both grow on forest edges.